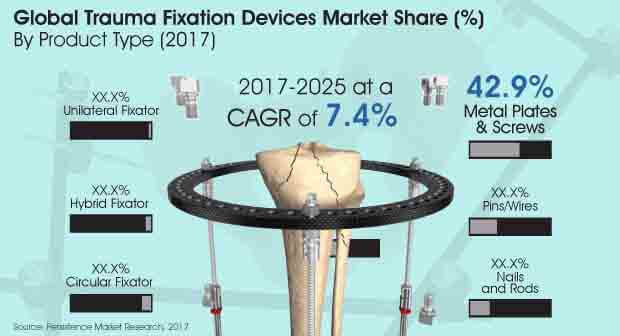 Persistence Market Research in its new publication, “Trauma Fixation Devices Market: Global Industry Analysis (2012-2016) and Forecast (2017-2025),” has given importance to the provision of after sales services, which is the key focus area of players in the global trauma fixation devices market. Mergers and acquisitions, strategic collaborations and technology transfer agreements play a vital role in the global trauma fixation devices market. The team of analysts who have extensively studied this market have understood the need to efficiently meet the requirements of various end users in different facility centers, while ensuring customized services. The team of experts have come to a conclusion that quality and positive outcome are of utmost importance to end use industries. Further, it has been noticed that acquisitions and collaborations are the key strategies adopted by global and local players for better service provision and to increase their consumer base in different geographies. The key part of this report is Persistence Market Research’s analysis and recommendations on the global trauma fixation devices market. The report takes an overview of the global trauma fixation devices market and also underlines factors influencing the growth of the global trauma fixation devices market. The analysts have also provided key strategic recommendations for both existing and new players in the market to emerge sustainably profitable. The report covers the competitive landscape that provides a dashboard view of companies that manufacture and provide services in the global trauma fixation devices market. The report contains company profiles of some of the key players and a strategic overview of mergers and acquisitions along with companies’ expansion plans across regions. Apart from including these factors, the team of expert analysts have also taken into consideration the various macro-economic indicators such as trauma fixation devices market outlook, gross domestic product and other pointers to arrive at the indicated market numbers. Top-down approach has been used to counter-validate the reached numbers in the global trauma fixation devices market, while bottom-up approach has been used to assess market numbers in the global trauma fixation devices Market. Weighted average selling price is considered to estimate the market size of various drugs mentioned in the scope of the study. The country price is captured with the local currency. The local currency figures is then converted to USD to offer forecasts in a consistent currency standard. Furthermore, this market research company has also considered the latest annual exchange rate to reflect the impact of the most recent economic conditions of country. Our research methodology uses both primary and secondary research to collect the relevant data. Persistence Market Research analyzed the market by considering the revenue through extensive primary research to understand the usage pattern, historic trends, and problems faced by the orthopedic, the required treatment developments, and most preferred drugs. Key opinion leaders were considered for the primary research that included experienced healthcare professionals in various healthcare facilities at country level. These estimates were further validated with drug manufacturers, distributors, and suppliers. Extensive secondary research has been carried out to understand the treatment rate, adoption rate, regulatory scenarios, average selling price, reimbursement scenario, by referring published scientific literature from various databases such as the WHO, PubMed, Springer, and Wiley among many others. We have also analyzed various companies annual report, investor presentation, SEC filings, 10k reports and press release operating in cancer market to fetch substantial information about the market size, trends, opportunity, drivers, restraints and to analyze key players. Persistence Market Research represents the historical global trauma fixation devices market grown from more than US$ 1,300 Mn in 2012 to more than US$ 1,700 Mn by 2016 end. This represents CAGR of 6.8% over the period of 2012-2016. In 2017, this market is expected to be valued for more than US$ 1,800 Mn, while in 2025 the market is likely to be valued more than US$ 3,300 Mn. An absolute $ opportunity represented by the global market for trauma fixation devices represents more than US$ 130 Mn in 2018 over 2017 and incremental opportunity of more than US$ 1,450 Mn throughout the projected period. Metal plates & screws is the largest segment in global trauma fixation devices market, which is estimated to represent more than US$ 800 Mn with more than 40% share of the total market in 2017 and US$ 1,472.7 Mn and close to 45% revenue share by 2025 end, expanding at CAGR of 7.8% over the forecast period of 2017–2025. While, pins/wires is the segment in global trauma fixation devices market is estimated to represent more than US$ 450 Mn of the total market in 2017 and is estimated to reach little more than US$ 800 Mn by 2025 end, expanding at CAGR of 7.5% over the forecast period of 2017–2025. Most people are aware that hip or knee replacement surgery is an option for patients with disabling or painful joints. Like the hip and knee, the shoulder joint may become arthritic and painful with the increasing age. While patients are becoming more knowledgeable about shoulder replacements, awareness still lags behind that of hip and knee replacements. Many patients who could potentially benefit are not aware that a trauma fixation devices is an option that can relieve pain and significantly improve function. This lack of awareness can hampers the growth of the global trauma fixation devices market. In some countries such as Brazil, Import duties for healthcare products range from 0% to 16%, depending on the existence of domestic competitors. On top of that, importers may need to pay tax on industrial products, PIS and COFINS (social contributions), as well as tax on the Circulation of Goods and Services levied by the states. This might act as a hindrance for many international trauma fixation devices companies to bring in their products. Trauma fixation devices surgery in Germany can cost around US$ 10,000. That’s the reason patients in Germany prefer to go overseas to countries like India, Mexico, and Costa Rica for trauma fixation devices surgery because of the incredible cost savings and the great quality of medical care available in private hospitals in Belgium, India, Mexico, and Costa Rica. Orthopedic surgeons here board-certified and have rich experience. This factor is affecting negatively on the growth of Europe trauma fixation devices market. Medical device purchasing decisions in China, are largely dictated by tenders and reimbursement. Although the Chinese government has been attempting to refine the tendering and reimbursement processes, those processes take place largely at the provincial level and are oftentimes nontransparent, so changes take place at slow pace. This delayed tendering and reimbursement streamlining has been a significant limiting factor in the growth of China’s trauma fixation devices market, especially for emerging products or technology. Sub-Saharan Africa ranks the least attractive region to commercialize trauma fixation devices because of the region’s poor operational environment and barriers to access healthcare. Due to economic and political risks which are ranging from security threats in Nigeria and Kenya, to lower commodity prices, pressurized aid flows and corruption, sub-Saharan Africa continues to have the lowest regional average in case of trauma fixation devices market.